The Building Blocks Beaded Cuff tutorial offers excellent beaded bracelets instructions to make exciting and funky beaded bracelets to go with any outfit. 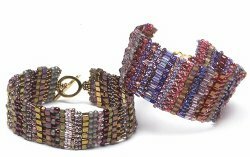 Make these seed beaded flat bracelets from Bead&Button Magazine for yourself, and make more as fashionable gifts. On a comfortable length of Fireline, pick up four 8/0 seed beads, and sew through the four beads again, leaving a 12-in. (30 cm) tail. Position the 8/0s so they form two stacks of two (figure 1, a–b). Work in ladder stitch, adding two 8/0s per stitch, until the strip is the desired width of the bracelet (b–c). Begin working in brick stitch, working each row using a different type or color of bead, until the bracelet reaches the desired length, minus the length of the clasp. You’ll need to adjust how many stitches you attach to each thread bridge, and which thread bridge you use first, depending on the relative size of the beads: If the new row uses smaller beads, you’ll need to attach the first stitch to the first thread bridge of the previous row (c–d), and you may need to attach more than one stitch to each thread bridge (d–e). If the new row uses larger beads, you’ll need to skip thread bridges as you stitch the row (e–f). 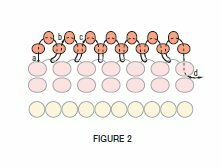 Stacks of beads can be substituted for single beads by treating each stack as a single bead (f–g). You can also alternate types of beads or single beads and stacks of an equal size (g–h). 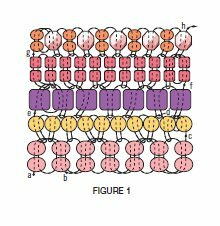 Pick up three 15/0 seed beads, and sew under the first thread bridge of the previous row, and up through the last 15/0 picked up (figure 2, a–b). Pick up two 15/0s, sew under the next thread bridge, and up through the last 15/0 added (b–c). Continue across the row, sewing down through the last bead of the previous row on the last stitch (c–d). Sew back through the beadwork to exit the center of the last row of brick stitch. Pick up six 15/0s and the loop of half of the clasp, and sew back through the bead your thread exited (figure 3). 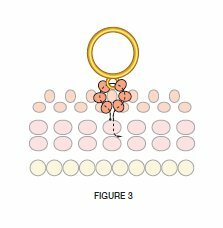 If you have an even number of beads in the last row, exit one of the two center beads, and sew down through the adjacent center bead after picking up the clasp (figure 4). Retrace the thread path several times, and end the thread. Using the tail, repeat steps 3 and 4 on the other end of the bracelet. This building blocks cuff bracelet is a very interesting project. I have saved it and just as soon as I get more practice with this kind of beading and become more confident with seed beading, I will attempt making this cuff. Right now it's a little over my skill level.